If you spend more than a few minutes with Bob Lujano you immediately realize that he is a typical man. You will also realize why he was named one of the 20 Most Beautiful People in Birmingham by Birmingham Magazine in 2013. Bob lives a completely independent lifestyle that includes a demanding career, participating in sports activities in addition to volunteering at his church and being an advocate in the area of adaptive and competitive wheelchair sports. He also serves as President of the USQRA, the United States Quad Rugby Association and is a motivational speaker. On January 7, 1979 at the age of 9, Bob contracted a rare form of meningitis. To save his life, all four limbs had to be amputated. Other people might quit, but Bob Lujano kept going and going and going. He is actually grateful for the childhood that stole his limbs, scarred his face and body, and left him with a questionable future. When talking about his childhood Lujano says, “It was the best life I could ever ask for. The pain and abuse and rejection were all necessary”. He earned a master’s degree in Recreation/Sports Management from the University of Tennessee, won a bronze medal at the 2004 Paralympic Games in Athens, Greece, co-starred in the Academy Award nominated documentary “Murderball” and was a guest on Larry King Live. Bob has worked full time at Birmingham’s Lakeshore Foundation for 16 years and most recently took a new position with the organization serving as an Information Specialist for the National Center for Health, Physical Activity and Disability. Publisher “Write With Grace” has recently released No Arms, No Legs, No Problem, Bob’s autobiography he spent the last seven years writing. 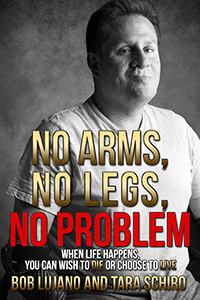 An inspiring look at life that offers encouragement and hope, No Arms No Legs, No Problem is a testament to the determination and will of the human spirit and a must read for anyone who has ever felt like the deck was stacked against them.